Well friends, a lot happened while I was away. Bits and pieces will make their way back here I’m certain, but there is bit of news that just can’t wait–I am getting married! And its in big part, because of a letter. You remember Adam, right? Well we’ve been friends for years, eleven to be exact. We met in college, fought over fridge space in two apartments, and stayed friends long after graduation. When he moved to New York City a few years ago we picked up right where we left off. Our families knew each other, I was the unofficial date to all plus-one affairs, and best of all, we genuinely enjoyed spending time with each other. After a few false starts, I decided it was time. This time, for real. So I sent him a letter. I picked this card, mostly because of its school-charm. 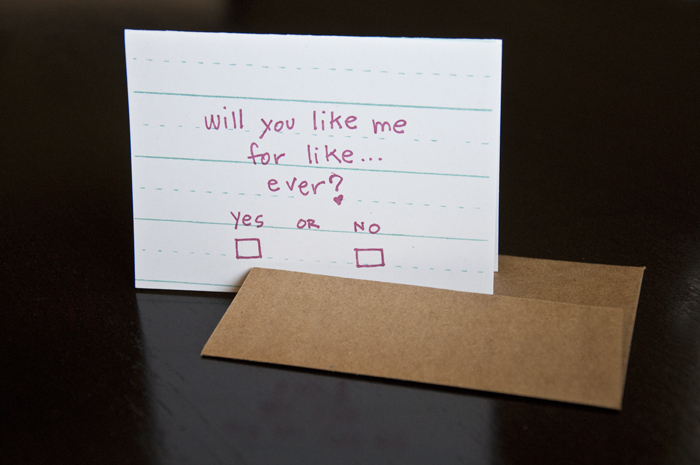 Do you remember passing notes like these in grade school? Inside I asked if it would be okay if I called him my boyfriend. I popped it in the mail and waited three (!) days for a reply. And just like that, we were going steady. And then, madly in love. Eight months later we were fighting over fridge space again. And a few months after that, Adam asked me to marry him on a boat at sunset. I am a sucker for love and I feel so blessed to have found the truest kind with Adam. Whats the best letter you ever sent? I think this one is mine. Thanks so much Marie! And thanks for commenting–I just love hearing from readers. AH!!! How wonderful! I love love :) It’s so wonderful that you are with someone you have known for so long and now you get to spend the rest of your life with him. EK! I’ll have to look into this comment business… so sorry! And thanks for your sweet words! I love that you have a love-letter story too! And what is better than marrying your best friend? !